Happy Gram - It's that Time...Jo's Little Women's Club with TimiAnn! This AMAZING quilt was done by our friend Lynne. She fell in love with the pattern the moment she saw it and we happily helped her pick out fabric. This Sue Daley Quilt Kit includes your fabric for quilt top and your English Paper Piecing papers and templates. The pattern is found in her book New English Paper Piecing. Liz used the, fat quarter friendly, pattern Big & Little and Moda's Little Black Dress 2 collection to create this romantic and elegant quilt. Spring is in the air and that can mean only one thing...Jo's Little Women Club with TimiAnn is about to begin. There are two meeting day options, Sunday and Friday. This great tote bag comes in 2 sizes. 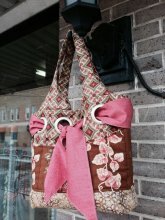 Janet will help you create your own beautiful Spring Purse! 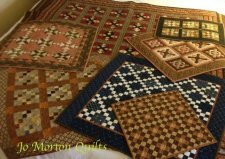 How often do you see amazing quilts and wish you could pick the mind of the quilter? Here is your chance! M.J. will feature a different technique or theory each month. This month M.J. will be discussing color. Join Carolyn as she shares her knowledge of quilt history. This morning talk will guarantee to leave you wanting to learn more about quilts. Topic for February will be red & white Quilts. All fat quarters will be on sale for $2.00! 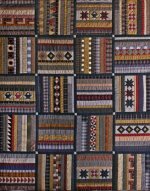 This year the Show Chair's Theme will be "Modern Quilts- Building on Tradition. We are looking forward to viewing all the beautiful quilts! Hope to see you there, come by our booth and say "HI" to Wendy, Andree and Laura Kay. Our street might be closed but Happiness is...NOT! You can still access our parking lot via Hunt Street. AND if you spend $50 between February 3 - 28 (Monday thru Friday) in the construction zone, you can receive a $10 gift certificate to a Downtown McKinney Restaurant. Go to MPAC ticket window to redeem.